can you feel it? valentine's day will be here before you know it! 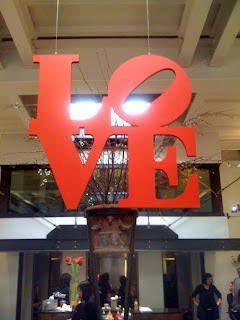 to celebrate, we've hung up replicas of Robert Indiana's famous LOVE sculpture around the salon (here's one hanging in our color department). are you getting in the spirit? what are your tried and true perfect v-day gifts? in our humble opinion, you can't go wrong with a spa package from nuBest...check out a list of our special valentine's day spa treatments and packages at http://www.nuBestsalon.com!